Panaji: Six years after the Right to Education (RTE) Act came into being, private schools in Goa still remain technically exempt from mandatorily admitting 25% students from disadvantaged and weaker sections, as required by the act. The state government claims to be still ‘working out the modalities’ for implementation of the rule, relieving private schools of their obligation for now. 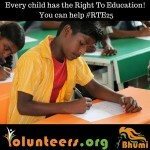 At the yearly review meeting by Union human resource development officials, Goa has admitted to having only ‘partially complied’ to Section 12 (i) (c) of the RTE Act, 2009. This ‘part compliance’ means that only a notification has been issued stating the requirement of implementation of admission of 25% children from disadvantaged groups and weaker sections in Class I in private unaided schools as mandated by RTE. And the ‘modalities’ being worked out apparently have to do with reimbursement by the state government of the amount spent by the private schools on the education of the disadvantaged children admitted in the unaided school, sources said. The association of private unaided schools, on the other hand, claimed that ‘hardly any poor students are coming forward to avail the facility’ in Goa and attributed it to relatively good living conditions in Goa. In most states, disadvantaged sections are defined as children of BPL (below poverty line) cardholders and Deepak Khaitan of the association of unaided private schools in Goa said that as there are very few BPL cardholders in Goa, there is only a small number qualifying for admission to the 25% reserved seats. Like it has been seen in other states, notification of the requirement of 25% reservation of seats in private schools by itself is insufficient to ensure its implementation. The most common roadblocks faced by states are mainly unawareness on the part of the potential beneficiaries, absence of any facilitation through the state administration for admission in schools, and lapse from the side of the government with regard to framing proper laws, payment to schools etc. With a new set of officials at the helm of affairs in the state in the education sector, few seemed to be aware of ‘modalities’ that need to be worked out.